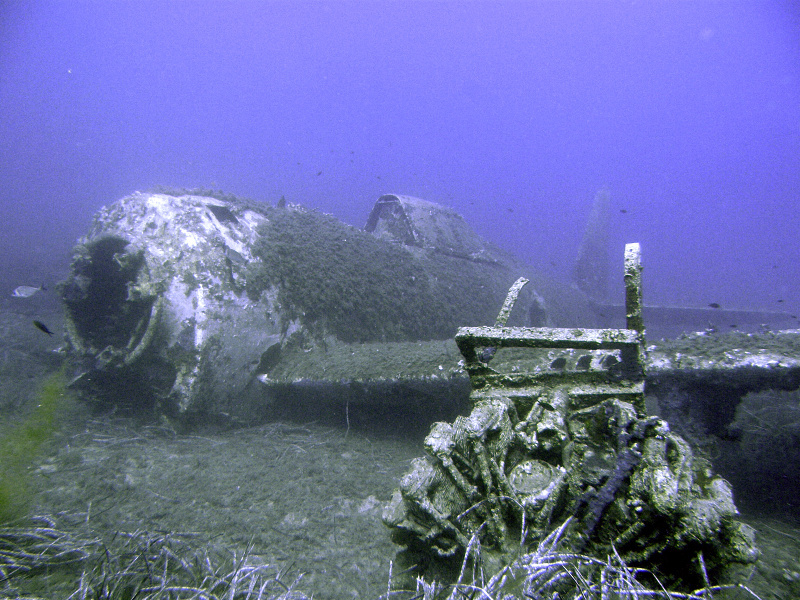 The P-47 Thunderbolt, C or D model, is sunk in the waters near the town of Bastia, France. The unit is very close to the coast and only 10 meters deep in crystal clear waters that allow a very clear view of the fighter. Despite the time elapsed, the wreck is in an amazing state of preservation, all in one piece including the wings, fuselage and tail section. The only flaw is that the engine is within a few meters from the wreck. Conducting a further examination on the plane you can see the absence of weapons. The wells that housed the Browning machine guns of 12.7 mm are open which suggests that probably stolen by some relic hunter. The cockpit is open after the pilot left his plane after making an emergency landing on water. The interior of the cab is in pretty good condition given the circumstances.